Macedonia continued to grow steadily in quarter four 2016 with year-on-year growth of 2.4 percent. 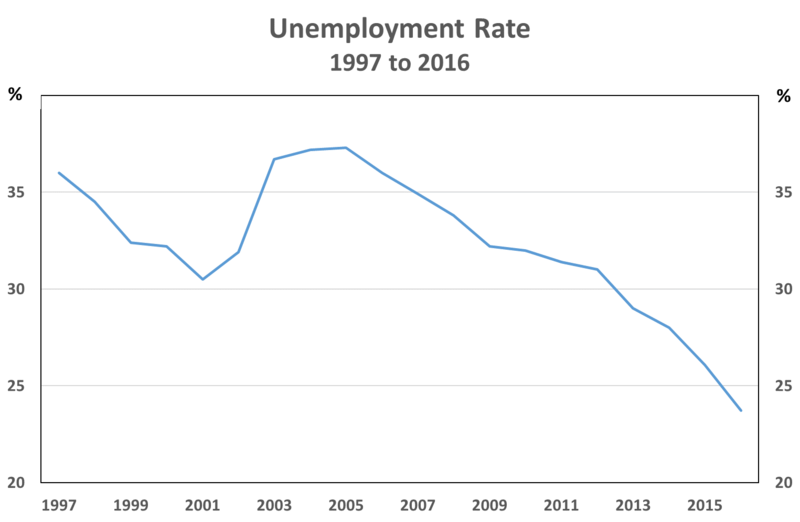 Unemployment continues to decrease and now stands at 23.1 percent; the lowest level in the last twenty years (graph 1). 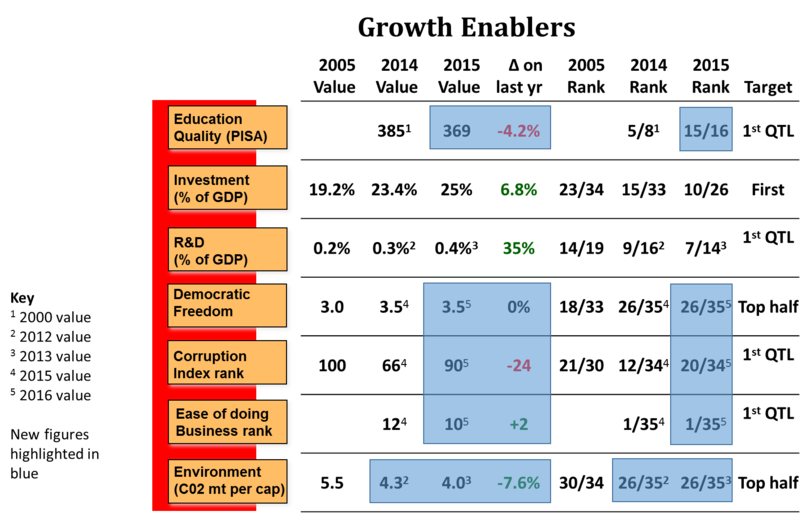 For the ‘Growth Enabler’ metrics, new data has been released for PISA (education), ‘Democratic Freedom’, ‘Corruption Perception’, ‘Ease of Doing Business’, and Co2 emissions. Macedonia’s ‘Ease of Doing Business’ ranking has increased to tenth in the world. Co2 emissions per capita continue to fall. Macedonia’s democratic rating remains unchanged. However, the ‘Corruption Perception Index’ shows that the perception of corruption increased for Macedonia in 2016. The PISA 2015 score shows that Macedonia’s education ranking has decreased relative to its peers since 2000. Albania, Indonesia, and Peru have all overtaken Macedonia in terms of their PISA scores since 2000. 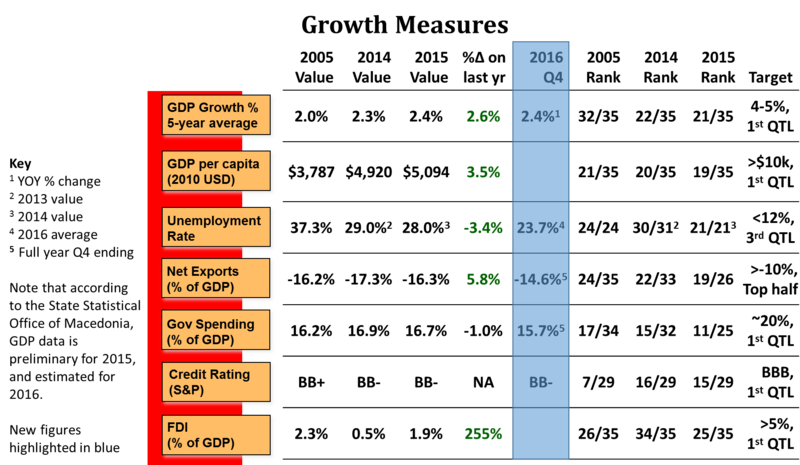 Macedonia continued its steady economic growth during the fourth quarter of 2016 with increases in real GDP of 2.37 percent (year-ending) and 2.41 percent for the year (table 1). Net exports also improved. Unemployment fell to 23.1 percent in the quarter with an average of 23.7 percent for 2016. This continues the downward trend in unemployment since 2005 (graph 1). Government spending increased by 2.5 percent for the year but fell as a percentage of GDP because of the greater percentage increase in nominal GDP. In December, the PISA (Program for International Student Assessment) scores for 2015 were released. PISA is a tri-annual OECD assessment of the science, maths, and reading ability of fifteen-year-olds across countries. Macedonia’s PISA score has fallen since the last time it participated (2000). Macedonia is now ranked fifteenth out of the sixteen MK2025 scorecard peer countries that also participated in PISA 2015. In 2000, Macedonia was ranked fifth out of eight among its peers. Since 2000, Albania, Indonesia, and Peru have overtaken Macedonia in terms of their PISA scores. Macedonia’s mean scores fell in all three areas: mathematics, reading, and science, however, only the reading score is directly comparable to 2000 because of a different performance scale. The top ranked countries were China, Estonia, and Singapore. Macedonia’s 2016 ‘Democratic Freedom’ rating remains unchanged from 2015. Macedonia’s ranking against its peers remains at twenty-six. Macedonia’s global ranking fell from 66 to 90 in the 2016 Corruption Perception Index. Macedonia is now ranked at twenty compared to its scorecard peers, down from its previous ranking of twelve in 2015. In 2016, Transparency International also released a report entitled, ‘Fighting Corruption in the Western Balkans and Turkey’, which included recommendations for improving corruption in Macedonia. These recommendations included strengthening merit-based selection of the judiciary, whistleblowing measures to help reduce political activities in police premises, and the prohibiting of political advertising on public media services. Macedonia has climbed two places to tenth in the World Bank’s 2016 ‘Ease of Doing Business’ survey. Macedonia continues to lead its peer countries in the ease of doing business. Macedonia’s carbon dioxide emissions per capita continued its downward trend since 2003, with each result since 2007 setting a record low since independence. This trend can also be seen in many of the other peer countries.